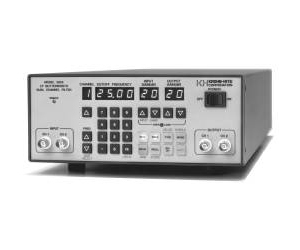 The Krohn-Hite Model 3955 programmable, dual channel, low-pass filter is the first dual low-pass programmable filter of its kind, covering the wide cutoff frequency range from 170Hz to 25.6MHz with 2 digits of resolution. The 3955 is a 4-pole, maximally flat (Butterworth) filter, with an attenuation slope of 24dB/octave and a stopband attenuation of >100dB referred to 1Vrms input. The filter has selectable ac or dc coupling and selectable 1M or 50 ohm input impedance. Programmable input gains to 20dB and output gains to 26dB are standard. The Model 3955 also has the capability to be configured in an “amplifier bypass” mode to operate as an amplifier, bypassing the filter. This gives the user the ability to amplify without filtering when so desired.